Is it still September? Only a bit more of the ninth month remains, which is probably for the best. September is a month of massive flux in both social and climatic terms. While saying so long to summer hurts, autumn in the Northern Hemisphere deserves our full attention. Anyway, October still boasts some excellent migrations! What will you be doing this weekend and will you be birding? I’ll be kicking around western New York awaiting something exceptional on the wing. Corey will be in the Albany area birding up his old haunts. 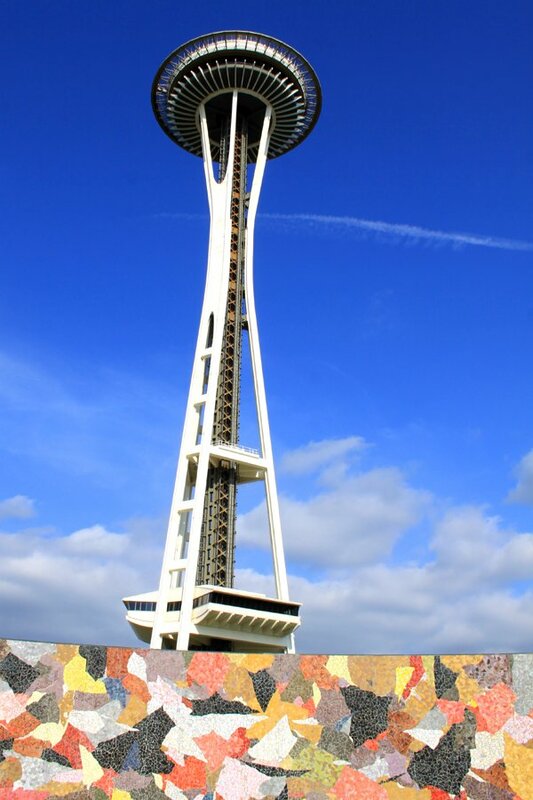 Space Needle against the Seattle sky! The Great Ornithologist Felonious Jive and I will be on a shearwater journeys boat, heading out of Half Moon Bay, CA…crossing fingers for Least Storm-Petrel or some bizarre shearwater or Pterodroma! Striking perceptive of this delightful artwork beneath a crystal blue sky! I should be joining one of two equally fab bird walks along Lake Michigan (having a hard time deciding which) … it promises to be a fab day for birding in Chicagoland!